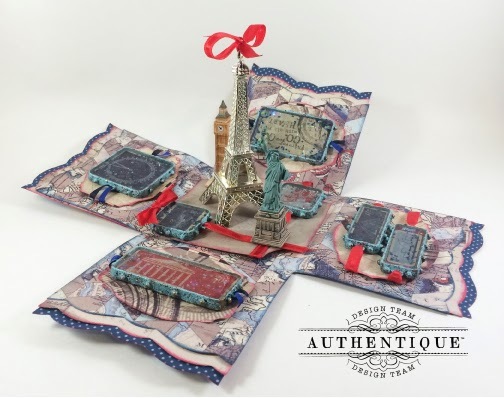 For those of you who visited the Authentique Paper booth at the CHA Show, this project may look a little bit familiar since the original was displayed at the show. 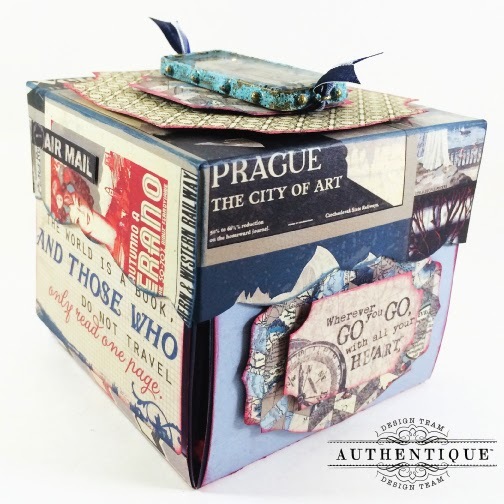 For the blog I recreated the box and added more destinations to highlight the versatility of the Abroad paper collection. 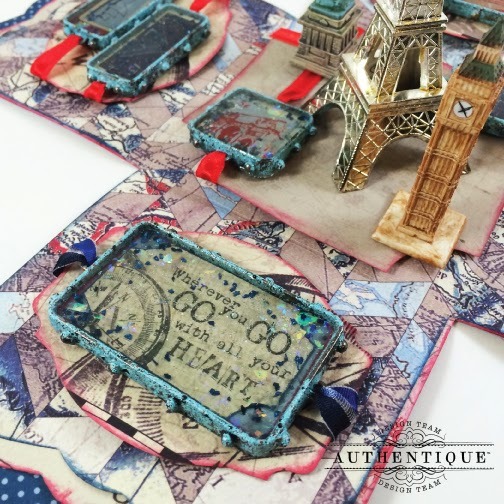 Whether going on a road trip across the county or heading for an international destination, this paper collection is versatile for any vacation! That's where the fun begins! 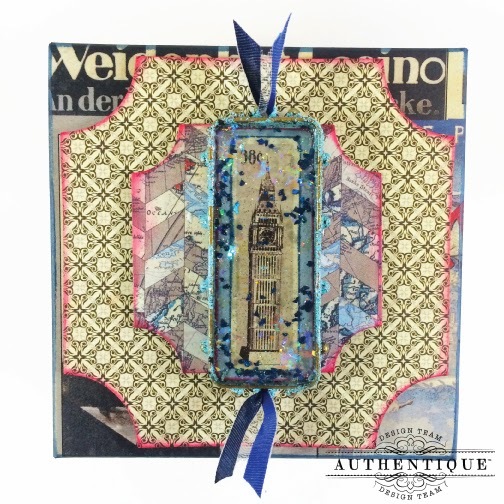 Once the box is opened, the possibilities are endless for embellishing the inside of your explosion box. 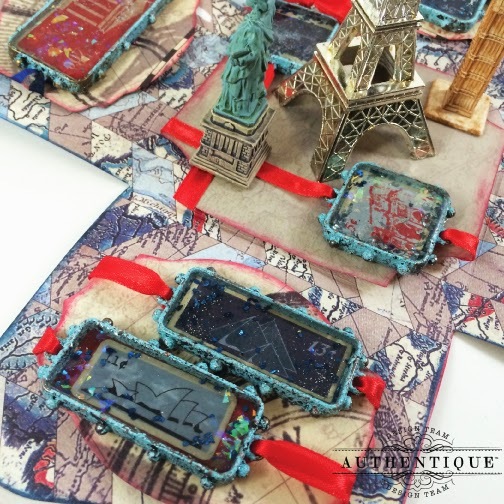 Don't limit your creativity to just scrapbooking – the Abroad collection offers great embellishments for creating jewelry. Break out those bezels and resin for making one of a kind bracelets, necklaces and more! WOW! The details are awesome! Wow, this is absolutely, incredibly amazing! This is great!!! The attention to detail really "makes it"!!! Nice job. What a great box. I love it. and the papers are beautiful. I didn't see the box at CHA but I saw the paper collection; I'm going to have to rethink my ordering priorities perhaps because this box is FABULOUS. 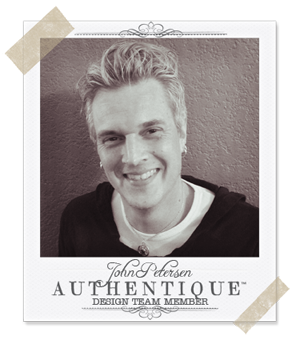 Perhaps John is going to have to do a class!!!!! Absolutely.... totally.... creatively... gorgeous!! Did I say Awesome too?